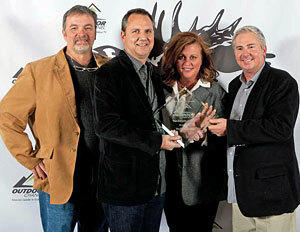 Receiving a Golden Moose Award for The Bassmasters TV show were (L) Steve Bowman, director of Web Content for JM Associates, Mike McKinnis, producer, Angie Thompson, Business Development director, B.A.S.S., and John Skrabo, B.A.S.S. sales. Photo Credit: B.A.S.S. LAS VEGAS, Nev. — Moose and bass don’t normally go together, but according to viewers of The Outdoor Channel, The Bassmasters television show is worthy of the industry’s highest praise — a Golden Moose Award. The Bassmasters, a year-long series that covers the professional Bassmaster Elite Series and Bassmaster Classic, was voted tops in the category “Fan Favorite Fishing Series.” Other nominees in the category included Bill Dance Saltwater and Speargun Hunter. McKinnis accepted the award Thursday night at the Hard Rock Café, giving specific credit to that team, Tommy Sanders, Mark Zona and the anglers on the Bassmaster Elite Series. The show is produced by JM Associates on behalf of B.A.S.S. The Golden Moose Awards honor the on-air talent, design and graphics personnel and producers of Outdoor Channel's industry-leading programming. "The Golden Moose Awards recognize the creative achievements of our quality outdoor programming, and the talented personalities and skilled production work that bring these shows to life," said Tom Hornish, COO at Outdoor Channel.